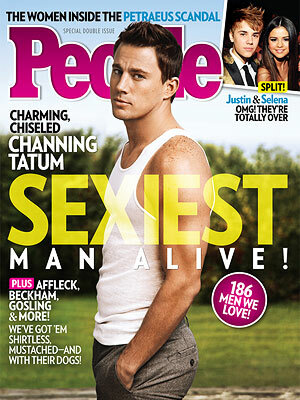 -To celebrate Channing Tatum‘s new Sexiest Man Alive title, please enjoy this Magic Mike dance break! –Kristen Stewart wore Zuhair Murad again to the London premiere of Breaking Dawn. Racy, but I kind of love it. –Chris Brown defended his terrorist Halloween costume by saying “I was dressed as the people you kill!” How can one argue with such eloquence? -Congrats to Elizabeth Banks, who just welcomed a second son via surrogate. –Zac Efron just became cooler by kissing Rebel Wilson. -Wait, Morgan Spurlock is directing the One Direction movie? What?! –Movie 43‘s second trailer has landed. I’m still so confused. So offensive, and yet so star-studded. –Kendall Jenner held hands with Jaden Smith, but it makes me feel like a creepy oldster to even look at the photo. –Jeremy Renner‘s new SNL promos have arrived. He doesn’t seem like a dude who easily laughs at himself. We’ll see. -There’s a reason this NYT restaurant review of Guy Fieri‘s new spot is going viral. –Rob Kardashian‘s high-end sock line is here — and it’s even worse than you could have ever possibly imagined. –Brangelina reportedly let their kids run free and throw food at a pizza parlor. Who has time to discipline when you’re designing furniture and saving the world? -Sad: Jon Bon Jovi‘s 19-year-old daughter was arrested after a suspected heroin overdose. –Rihanna looked uncharacteristically demure and adorable on today’s Ellen. -Here are some pics of Aaron Paul at last night’s GQ event. You’re welcome. –Oz: The Great and Powerful finally gets its first full trailer. I can’t help but wonder how much better this would be if James Franco wasn’t being so James Franco-y.